Cary “Kiss” Kissner started his business in 1981. Five years into the business Cary hires his first employee. Now over 30 years later, Kiss has nine employees and expanding into a new location with seven different buildings on the property, to maintain his collision repairs, police and fire emergency vehicle set ups and also the corvette and muscle car restorations. We currently have one 1961 corvette which has obtained Bloomington Gold Certification Bruce and Jodi Durant’s. In 2008 we will be getting three more C-1 certifications at Bloomington Gold. 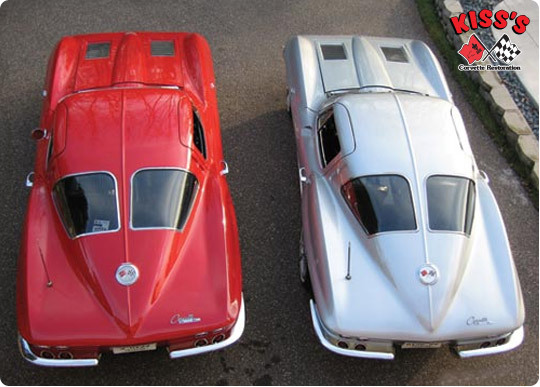 To look at future 1960 white (Jody and Cary Kissner) and 1960 black (Traci and Steve Wills) corvettes to be certified Bloomington Gold 2008. To check out the current certified Bloomington Gold 1961 corvette of Jody and Bruce Durant done by Kiss’s click here. After these classic cars receive their Bloomington Gold certification we’ll be going to get them judged at the NCRS Top Flight Certification. Because of Cary’s sterling reputation he says “our continued success is determined by the quality of service we provide our customers, your satisfaction has been guaranteed since 1981.” Please give Cary a call to set up a tour of our facility like many of our corvette clubs have done (Classic Corvettes of MN, St. Croix Valley Corvette Associations, Suburban Corvettes of Minnesota, and Northstar Camaro Club of MN).